Holidays in Ravello bring you beautiful views of the Neapolitan Riviera from its clifftop location. Here you’ll find some of the best shops, bars, restaurants and hotels the Amalfi Coast has to offer, combined with Roman villas and succulent sub tropical gardens. Couples will love the serene atmosphere, fine dining and beautiful surroundings, while families can enjoy gardens and easy access to the many attractions along this stretch of coast. Spend your days in Ravello taking in the views of the sparkling Mediterranean below, wandering through perfectly manicured gardens. Villa Rufolo’s garden is said to have inspired Wagner’s opera, Parsifal, which you can hear in the town’s opulent opera houses. If you want to explore the mountains there are opportunities for hiking and mountain biking, or you could head down to the coast for golden sandy beaches. Hire a car and explore the other towns in the area, including picturesque Amalfi or the spa town of Ischia. 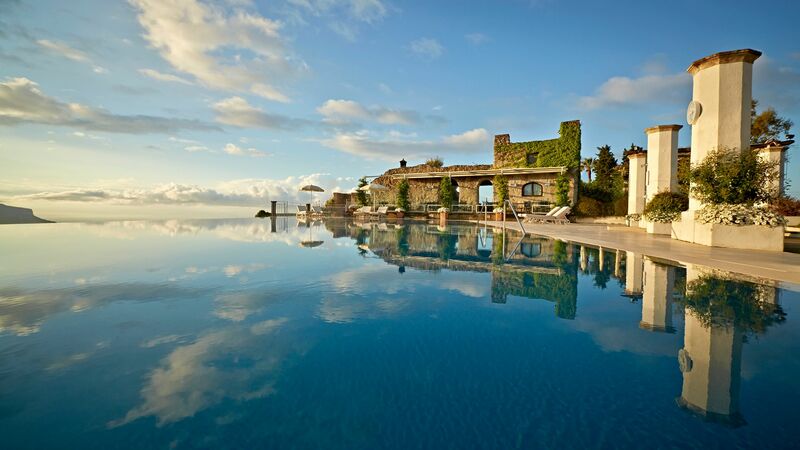 Luxury holidays in Ravello bring you a serene and tranquil atmosphere with beautiful surroundings. Emerald green mountains provide a backdrop to the town, while to the front you can take in views of the glittering Mediterranean Sea. The town itself is mostly pedestrianised and is home to winding narrow streets where you can stumble across excellent restaurants, bars and cafés, as well as little ceramic shops housing the work of some of Italy’s most celebrated designers. For a sense of history, the main square is home to an 11th Century Cathedral, as well as pizzerias and shops. Book your luxury holidays in Ravello with Sovereign and we’ll help you find the perfect spot for your trip. All of the hotels we offer have been carefully selected and tried and tested to ensure they match our standards, so you can relax, knowing everything has been taken care of. Stay at the Belmond Hotel Caruso and enjoy historic architecture throughout, as well as a dazzling infinity pool with impressive views and serene gardens perfect for exploring. If it’s world-class views you’re after, then walk to the viewpoint on the hairpin corner of Via Giovanni Boccaccio and Via della Repubblica. This is one of the best views in Italy – a wide-angle vista that takes in the sheer green hills of the Amalfi Coast and the pastel villages huddled below. To pair that view with a quintessential Ravello garden, then pop next door to Villa Rufolo. Its gardens are a tiered masterpiece of symmetrical flower beds, Renaissance-style sculptures and pond-side trellises, all backed by cinematic sea views. Transfer time from Naples airport to Ravello is approximately 1 hour 40 minutes. Any time from April through to October is a fantastic time to visit Ravello. The summer months are when temperatures are at their highest, reaching highs of around 30 degrees. Early or late summer is when temperatures drop slightly, though you will find it still pleasant enough to enjoy an aperitivo outside. If you do decide on the summer months, from June to September, Ravello hosts its annual music festival.